Who would have known that after three full length albums Ben would still be a solo artist. 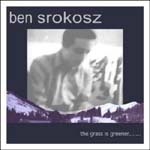 Partly due to fizzled out band attempts and a lack of patience, Ben brings us his 4th release, an EP entitled “the grass is greener.” It is a play on his move to BC. The EP features 7 new songs, a cover of “Listen” by Eric’s Trip, and 2 unreleased songs by Ben’s short lived band, Touch Green. There you have it, “the grass is greener.” Be it in someone else’s life or home, or province, or country all Ben could do was write some songs to tell his friends how hard it was to leave, how much he missed them, and how he hoped to return.